Split-release 1.44.900 / 2.10.38 deprecates the old, file-system based warehousing scheme (introduced in 1.42.856) in favor of calls to the V2 API. In addition to eliminating 12 - 30 second dashboard page load times entirely, the cut-over will also improve the timeliness and accuracy of "World" data. As far as the general progress towards a functional V2 application is concerned, this release is a pretty major milestone: the /world route is complete, accurate, extensible and ready to support the new V2 webapp. This release also pushes a handful of new modules for user and game asset management in the V2 framework, so this release represents progress on that front as well. 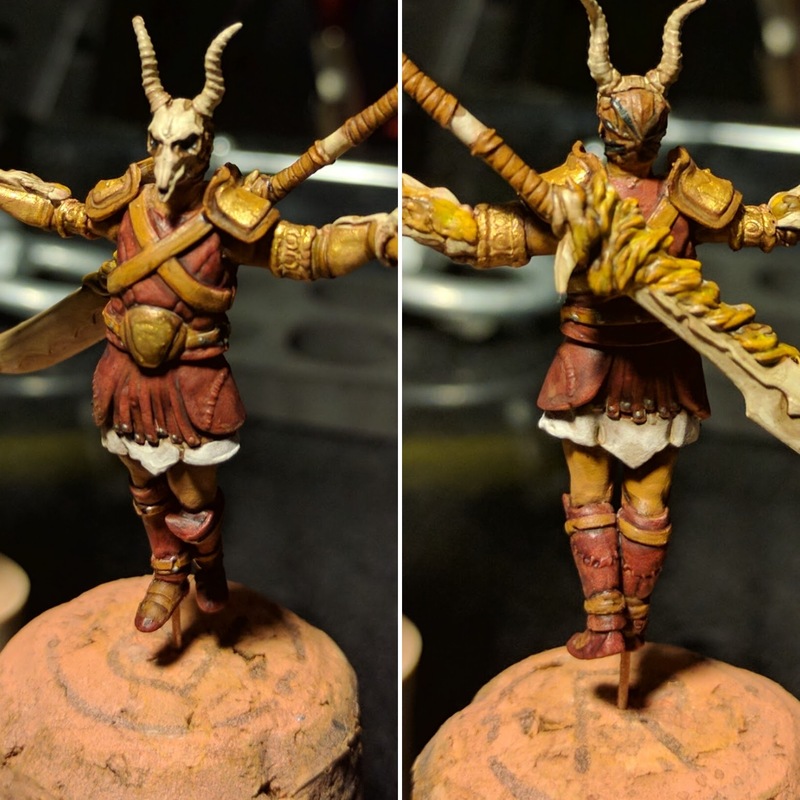 I know I said that I was going to focus on back-end/architecture improvements related to V2 until Black Friday (or whenever we have a beta release of V2 ready to go), but my Dragon King showed up (from Europe) the other day, and I've kind of got a hankering to add support for that before I do too much else. Hit the jump for full change notes. This release continues to migrate warehouse methods from V1 to V2 and make major progress on the general back-end architecture for the V2 API. Also, notably, models and assets have been refactored to use Django-style classical inheritance (where you've got an assets object that has methods that tell you about what's available and you can also initialize a discreet monster or innovation or whatever object to work with it, etc.). Not a lot of user-facing stuff in this one, but it makes major progress on the back end and puts me on track to deprecate the pickle-based warehousing routines in the next couple/few days. This release, which pushes two tiny modifications to the V1 app, is the first production release of the Manager that uses V2 API calls. 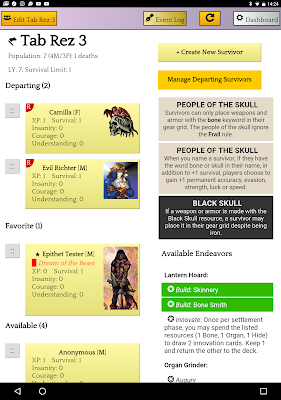 There are no corrections or fixes in this release, but the V1 webapp now makes a call to the V2 API when adding defeated monsters to the settlement storage: the purpose of the call is to look up the monster in the V2 assets and supplement the defeated monster meta data with data from the V2 API. Like I said, it's not much, but it's a start. Work on the V2 project continues! As of today, the architecture has changed, and we decided a couple of weekends back to split the presentation/front-end from the back end. Functionally, that means developing and deploying a standalone API in order to facilitate a full separation of concerns. (Which, if you recall the last attempt at V2, was the original design: we went all the way around and came back to where we started, essentially). The Gunicorn documentation is also excellent and extremely accessible. At any rate, the v2 codebase so far is available on GitHub, if you want to take a look. The change log for 1.43.887 featured a picture of my painted Fade mini. I recently picked up a macro lens, and while trying to teach myself how to use it, I ended up taking a bunch of interesting shots of the model that I didn't pose in the change log. Rather than letting them die on the cutting room floor, however, I decided to create a gallery of them. Obviously this is a off-topic for this blog (which is neither a painting blog nor a photography blog) and I am not putting either the paint job or the photography out there as especially good examples of either, but these shots made me happy, so I wanted to share. At any rate, for more Fade shots, hit the Jump. Otherwise, we'll be back to business as usual in the next update. 1.43.887 is a milestone release! The biggest item in the Tablet Resolution milestone release is support for a new CSS breakpoint intended to improve usability for tablets. As far as the Manager is concerned, a "tablet" is a device whose display has a min-width of 700px at 3dppx but who comes in at less than 1050px min-width. In terms of features and usability improvements, this release also adds a few new user-inspired features and dashboard queries. 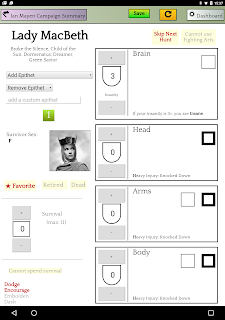 The "People of the Skull" campaign from the core rules is now an option when creating a new settlement and the "World" panel on the Dashboard now lists the most popular survivor names, etc. As far as general usability and optimization goes, 1.43.887 refactors the Dashboard quite a bit, separating the "About" type information from the "System" panel and placing that info in a new panel. The "System" panel has also been refactored and preferences are now organized according to type, which has been a long time coming. In addition to the usual presentation and bug fixes, long-time users of the Manager will be pleased to hear that I finally nailed down the random disorder bug (where an ineligible, otherwise non-selectable disorder could sometimes be applied to a survivor), so that pulls an annoying little thorn from everyone's paw. 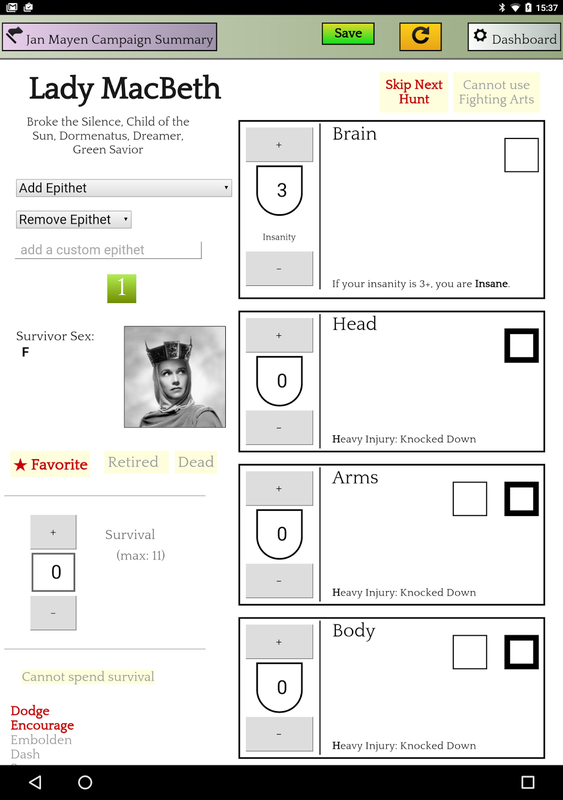 Finally, the next major milestone is a refactor of the Survivor Sheet. I was originally targeting late October for that, but given the V2 project and other projects competing for my attention right now, it's looking more like late November or early December. Depending on how things go with V2, I am considering suspending feature development on V1 again (sort of like I did last time we worked on the V2 project). If that happens, I will continue to add expansion support until I've got coverage for everything. Due to competing priorities, it took a lot longer than expected to finish up the last couple of views. The good news is that I was able to pull in a few more feature/usability items for the release, so the Tablet Resolution milestone will go out to production with a touched-up set of Timeline controls on the Settlement Sheet, among other things. The Tablet Resolution is actually about 1/3 larger than the last major milestone release, so before I put it into production, I am going to spend a little time with it, just to make sure I didn't miss anything major. At any rate, look for the release to go out at some point this week. At this point, I'm going to say Tuesday at the earliest and Wednesday at the latest. Turns out that I lied yesterday: the Tablet Resolution milestone release is not going into production today. Long story short, I started working on the Survivor Sheet and Settlement Sheet views at tablet resolution and got kind of sidetracked: I started doing some non-trivial refactoring/optimization of both views and I also decided to pull in a number of issues from outside of the milestone and hack on those a bit. At present, I've got one outstanding issue and more tablet resolution view to finish before I'm ready to test it out and, if everything looks good, release the rest of the update. I'm feeling good about getting this done at some point tomorrow, so the current thinking is that I'll have the milestone release ready to go on Tuesday or so. The delay is definitely annoying, but the good news is that this release is going to push a handful of new features, include more than a dozen fixes/corrections and resolve more than 30 tickets. the "People of the Skull" campaign. Screen capture taken on a Pixel C.
I had originally planned to release it today, but I am running behind schedule, so the next milestone release will go into production at some point tomorrow (probably late afternoon, Central time). For a sneak peak of what's coming, feel free to review the milestone on GitHub. Otherwise, consider this the official "heads up" that a slew of major, long-awaited improvements and fixes are going out tomorrow, including modal controls for managing Departing Survivors (formerly the Hunting Party). Also, in V2 news, I am happy to say that the development team on the V2 project has expanded to four people (total). This morning, we had a good, long conversation about goals and general architecture and we are off and running on our various pieces. Watch this space for more news about the V2 project, including alpha/beta release plans, as it becomes available!